Rare birds, demon lords, and nifty items: Skyward Sword has them all. Eiji Aonuma, the overseer for the Legend of Zelda franchise has shared a bounty of details about the upcoming Skyward Sword, revealing how the game will be different from the other games in the series. If you're concerned about minor, almost trivial, spoilers do not read any further. According to Aonuma, the game's opening plays out a little differently than previous titles. The first part of the game is set in a boarding school in the realm of Skyloft. This section will play out like a school drama, with Link being something of an outsider thanks in part to his rare bird companion. Aonuma says that the bird racing section seen in Nintendo's E3 demo was actually Link competing against his rivals. Interestingly, Zelda isn't royalty in Skyward Sword, instead being Link's classmate and childhood friend. Players will get to see a lot of Skyloft, as, much like Clock Town in Majora's Mask, it will serve as a hub location for the game, and many of its inhabitants will get caught up in the main story. Aonuma also revealed that the harlequin-esque Lord Ghiraham, seen in the E3 demo blocking sword hits with nothing more than his fingers, will play an important part in the game, filling a role similar to that of Dark Link in Ocarina of Time. "You can sort of swing your sword wildly and still hold your own against a lot of foes," he said. "but there's no way you can beat Ghiraham like that ... I think he's a pretty good change of pace as bosses go, and he'll change gradually throughout the game." Skyward Sword will also mix up the inventory a little. Aonuma said that the core Zelda gameplay required a certain item set, which meant that the new and interesting items had to wait until later in the game. Shigeru Miyamoto was keen for that not to the case in Skyward Sword, Aonuma explained, and that a lot of the really interesting items appeared earlier on. 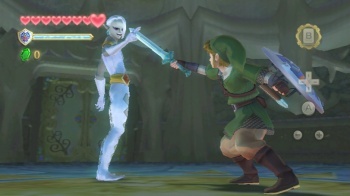 Legend of Zelda: Skyward Sword is set to come out later this year.